Domestic fuel prices suffer a lag in reflecting international price fall because of weakening rupee and various government levies. Ideally, domestic fuel prices should tango with the international crude price. But in place of the government deciding the price, the oil companies can now fix the price based on the landed cost of crude. The government has also removed the fortnightly announcement of the price and now the companies can decide the price on a daily basis, mirroring the overseas price. One of the world's largest oil importers, India buys nearly 70 per cent of its domestic demand from the international market. This leaves the Indian retail price at the mercy of the international market. The international price of Brent crude has dipped below $60 a barrel, the lowest in one year. The sharp price drop to about $58 on Friday has been unusual despite several international factors that could have hardened the oil. The Opec (Organisation of Petroleum Exporting Countries) has announced its desire to cut production, a factor that tends to push the price upward. The continuing tension between Iran and the US-Saudi alliance and the ongoing wars in Yemen and Syria are geopolitical factors that should have kept the oil afloat. However, the international prices have been sliding from a recent high of $86.2 touched on October 3. The bearish trend does not look like turning anytime soon. The domestic fuel price, however, does not reflect this steep fall. It has been sliding gradually, but lagging the international price considerably. Domestic petrol price touched a high of over Rs81 per litre in September in Delhi. 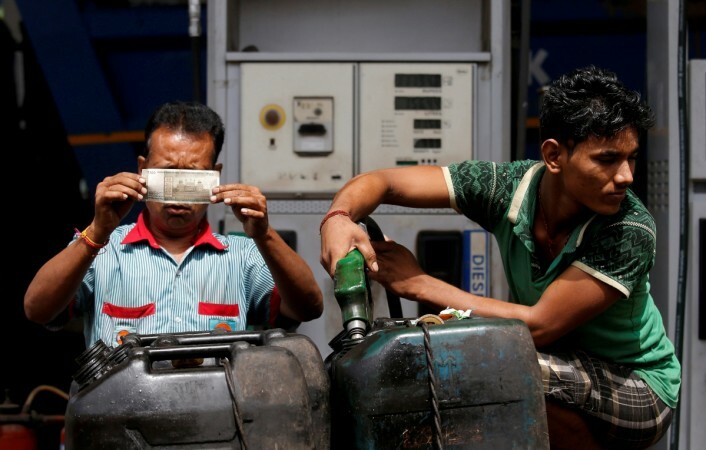 As the Indian Oil website points out, the bulk of the cost of petrol and diesel in India is government levies. To demonstrate this, the website gives a breakup of the different factors that add up to the petrol sale price of Rs 74.03 as of April 8. The dealer gets petrol for Rs 35.21 on which the government adds the following: central excise Rs 19.48; dealer commission Rs 3.60; and state VAT (value added tax) Rs15.74. Finally, the consumer pays Rs 74.03. The central and state government levies are calculated as a percentage of the base price. This means, the higher the base price, the higher the share of the governments. The state VAT varies from state to state. Maharashtra levies the highest VAT among all states on petrol at 39.12 per cent in Mumbai, Thane and Navi Mumbai. Punjab levies 35.12 per cent VAT on petrol and Andhra Pradesh 35.77 per cent. Goa levies the lowest at 16.66 per cent. That would lead to the question of why the central and state governments keep the levies so high. Fuel tax forms a significant share of the receivables in the budget. Any weakening in this revenue stream would tell on the funds available for developmental works. Any upward revision of these government levies will reduce the retail price's ability to reflect the change in the international crude price. There have been several instances when the central government announced a rise in the excise duty offsetting the fall in the international crude price. The landed price of the crude for Indian buyers is also affected by the exchange rate of the rupee. Thus if the rupee falls steeply against the dollar on the same day as a fall in the crude price, the resultant drop in the retail price might be negligible. There could even be a rise in the retail price, against a drop in international crude price. The Indian currency has been on a rollercoaster ride over the past few months, significantly weakening against the dollar. The currency has been a clear villain in keeping the retail price high. With all these factors playing the spoilsport for the domestic retail consumer, the lag in the monkey's response to commands from below is understandable.